The Zinus Deluxe Faux Leather Bed Frame is a faux leather wrapped bed frame that has been given a beautiful espresso color. On its durable steel frame, you will find foam padded tape in order to allow you to enjoy noise free usage. It comes available in most sizes. 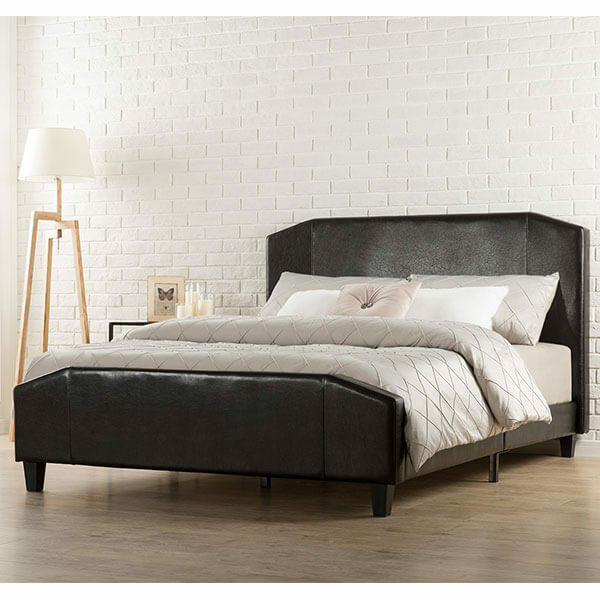 The DHP Dakota Faux Leather Upholstered Platform Bed is a padded and upholstered platform bed that is covered in faux leather and tufted for modern appeal. It sits atop durable metal side rails while the mattress will be supported by 24 wooden bed slats. There is no need for any box spring or other additional foundation. 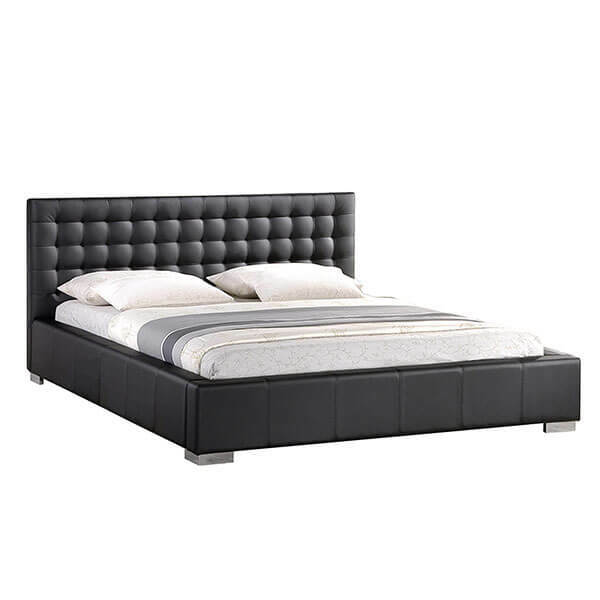 Modern and sleek, the Zinus Faux Leather Upholstered Platform Bed with Wooden Slats is an ultra strong bed frame given a black faux leather upholstery. It is padded for your comfort and sits atop a durable frame. Wood slats support the mattress which is sold separately. With its heavily tufted headboard and its sleek faux leather design, the Baxton Studio Madison Black Leather Bed Frame is a modern bed frame that can add sophistication to any bedroom. It is covered in foam padding and black faux leather to make it simple to add to any room. The classic shape and the faux leather covering of the Zinus Sculpted Faux Leather Upholstered Platform Bed with Footboard makes for a beautifully traditional bedroom. 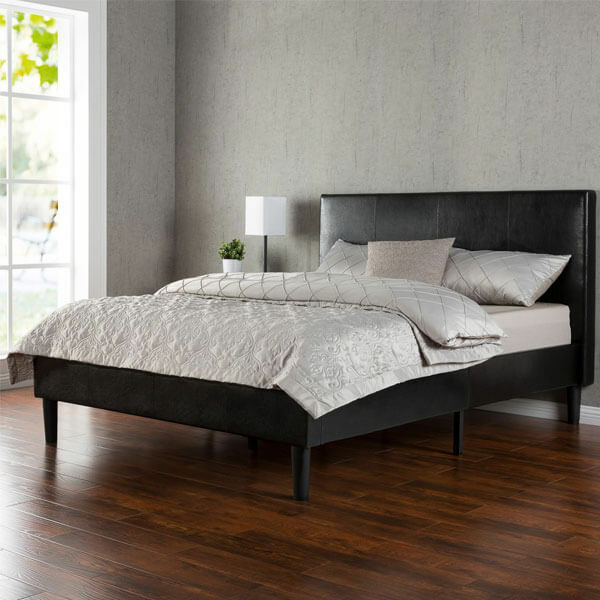 This bed frame is complete with espresso-colored faux leather and durable wooden slats that will support the mattress that is sold separately..
Sleek curves and minimalism combine to bring you the ultra modern Greatime Contemporary Leather Bed Frame. This bed frame is upholstered in cushioned, faux leather upholstery in black that can work with any colors in your bedroom. It comes with wooden feet and needs no box spring.